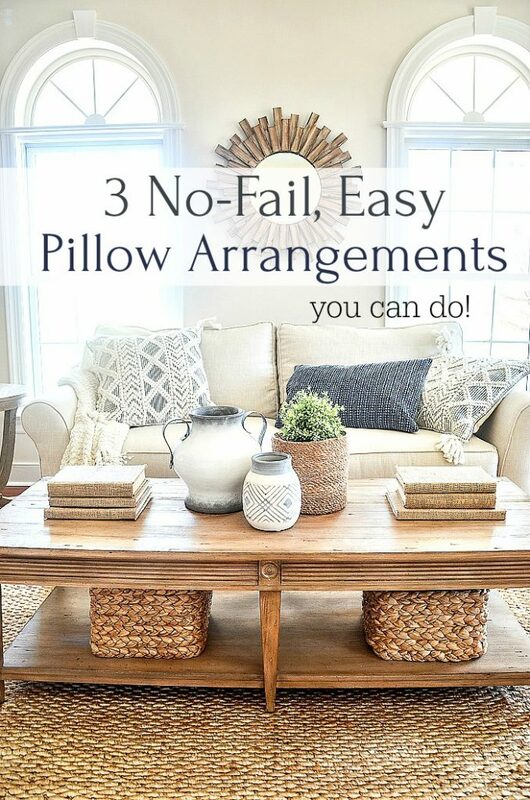 Finding no fail pillow arrangements for a sofa is simpler than you think! And they can change the look of a room! I’ve compiled my very favorite, easy and foolproof ways to add pillows to a sofa and I’m sharing with you, my friends! I have a few videos to share too! Any one of these pillow groupings would work with a one, two or three cushion sofa. This is probably the most popular way to add pillows to a sofa. Can you guess why? Symmetry! Our eyes and mind love symmetry! And if you are a pillow lover this is for you! Easy right? This is a no-brainer arrangement! 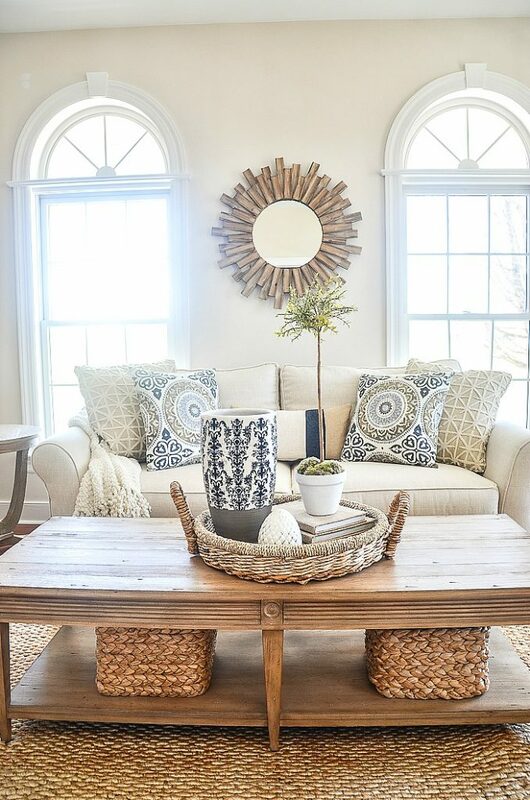 Here’s a fun video to show you how I styled the pillows in my living room. I love this second easy pillow arrangement! 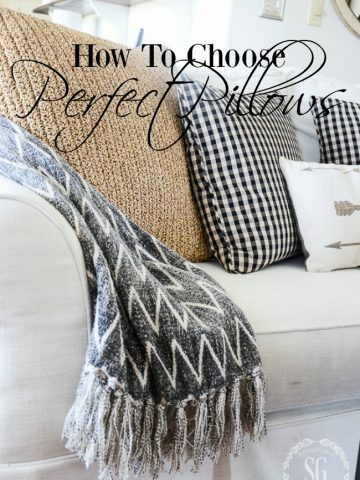 It’s sooooo doable and grouping three pillows together gives a big punch of pretty to a room! Finally the last arrangement is very popular right now and it definitely falls into the “no-fail” category! It has a casual, comfortable look and feel. And you can create it in no time at all! Therefore, this may be a very updated choice to try! a pair of pillows on either end of the sofa, one propped upright and the other slumped casually over on the other end of the sofa. Yet another fun video! By the way, do you like the coffee table arrangement. It’s new for me! And those are my favorite stylings for a sofa! Easy right? It’s nice to see these arrangements however styling them in your own home is even better! So make a goal to try one of these arrangements on your sofa today! And remember to let me know how they worked! Also, let me know in the comments if you like the little videos. If you like them I’ll try to do more of them! Sign up to get 50… more like 100 inspirational decorating ideas in a flipbook! I love all of these looks! 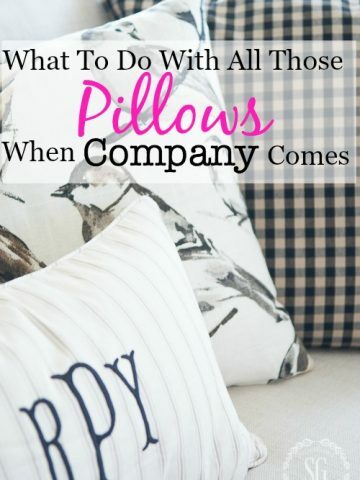 I especially like that you used a lumbar pillow in each arrangement – I’m never quite sure how to style mine so this gave me some great ideas. 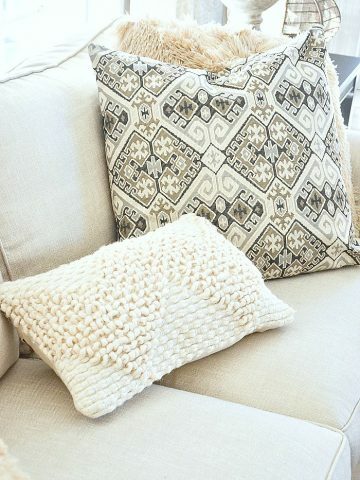 Love these easy pillow ideas. And yes, the coffee table caught my eye immediately! I LOVE it! What about those darn sectionals, the ones that basically give you 3 ends to put pillows at? I haven’t figured that out yet. Yvonne, I love all three of your pillow arrangements! A great way to add color, style, and texture! My problem is that my husband falls asleep on the couch every single night!!! It seems impossible to have pretty pillows on the couch. Any thoughts on how I can have a pretty sofa and a happy hubby? I put the pillows in a basket or on the floor and before I go to bed (or maybe the next morning) I put them back on. Time yourself- it only takes a few seconds. I would make this part of his or your routine! Hope this helps! that he can use in place of the “nice” pillows. ? I love all of your posts. Your heart shines through in each one. I love your ideas of adding pillows. Any suggestions for a leather sofa? Pillows and afghans slip and fall on the slippery leather so I have a hard time keeping anything on the couch! Great question. I like to use very textural pillows on a leather sofa. They tend to “stick” together and often stand up on a sofa. Im a little OCD and must have symmetry. lol Love the pillows !! Yvonne, Great post!!! I love all three arrangements and it is amazing how different each makes the room look. 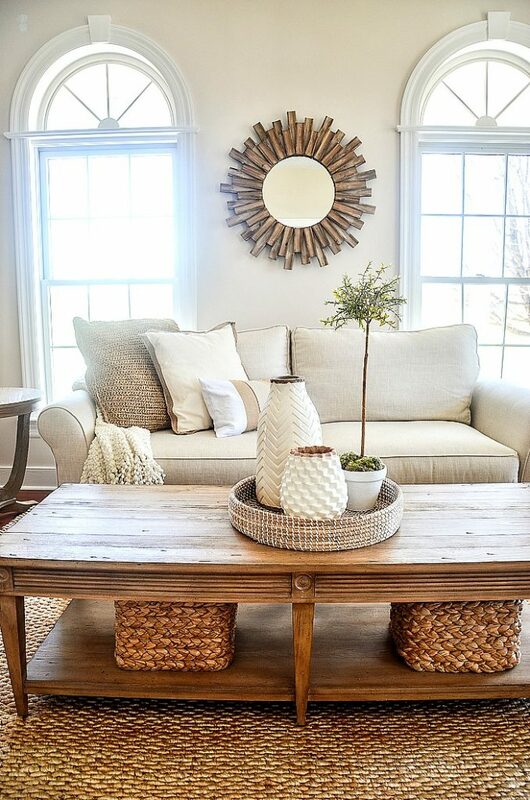 Love, love the coffee table and all the arrangements on it. Awesome!! Love your design and decorating and your e blog has fast become a favorite of mine! 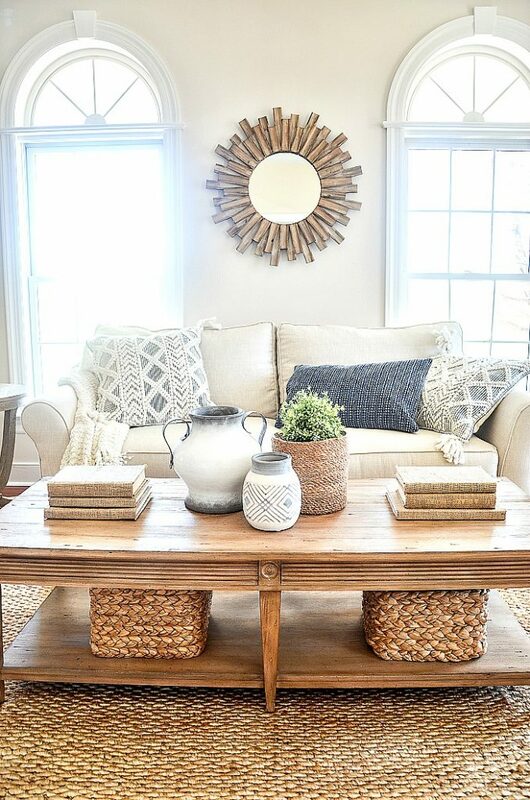 Can you please tell me where you found this natural fiber area rug under the coffee table shown here? It is so helpful so be able to see where you found these great decorative objects! I like the short videos. It really called attention to the coffee table centerpieces which would have gone unnoticed if I hadn’t viewed the videos. Really like how you tied in the centerpieces with the pillows. I loved your post today about pillow arrangements. I have struggled with this in the past, so this was very timely. Thanks for all the decorating help you offer.